Please join us to celebrate recent Japanese-Canadian publications. In 1942, over 22,000 Japanese Canadians, many of them Canadian-born or naturalized citizens, were labelled enemy aliens, forcibly rounded up, and processed through the cattle barns of Hastings Park before being shipped to road camps, internments camps in the interior of BC, sugar beet farms in Alberta and Manitoba, and POW camps in Ontario. They were not permitted to return to the west coast until 1949, three years after the war ended. 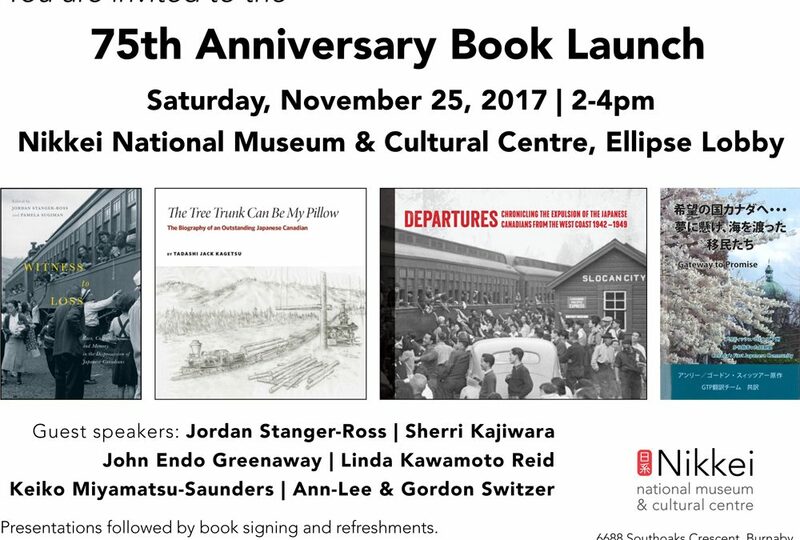 The Nikkei National Museum is pleased to announce the publication of a new book – Departures, chronicling the expulsion of the Japanese Canadians from the west coast 1942-1949. Using archival photos, the memories of survivors, recipes from the camps, artefacts, and poetry – tanka and haiku – the book presents a multi-dimensional portrait of a people forced from their homes and scattered across a country that did not want them. Woven through the book are the voices of the sansei and yonsei – the third and fourth generations – o­ffering echoes of those years that continue to resonate long after the last camp was closed down. Originally published in English in April 2012, revised in 2017. Translated into Japanese by team of translators lead by Keiko Miyamatsu-Saunders in 2017. The Gateway to Promise was awarded the second place in historical writing by the BC Historical Society in 2013. For the first time, the history of Canada’s pioneer Japanese community is recounted, beginning in the mid-1880s. Victoria, British Columbia was the “Gateway to Promise” for the Japanese immigrants. This book begins with the earliest races of Japanese presence on the Coast, then goes on to the first recorded visits of the Japanese to Victoria, and eventual settlement-in the first seven chapters. Tragically, the entire Japanese Canadian community of Victoria was exiled to the interior of B.C. in 1942, after Japan entered the Second World War with an attack on Hong Kong. In the book’s mid-section, specific topics of that history are dealt with in more detail: the Japanese Church, the farms, sports, and more. The last section consists of memoirs of the some of the survivors: their youthful days in Victoria and their families. Here is a book which can be picked up at any point. Do you enjoy stories about people? Read the third section. Detailed history? Choose from the Section Two. Or for an overview start with the First Section. 396 pages, over 200 historic photos, paperbound. ANN-LEE SWITZER is a historian and writer with an interest in the Japanese Canadian experience; as well she has a long-standing affection for Emily Carr. In 2007 she published This and That, the Lost Stories of Emily Carr (Touchwood Editions). A regular writer for the Victoria Nikkei Cultural Society’s Nikkei Forum, she has also contributed articles to Nikkei Images and Nikkei Voice. She and Gordon Switzer produced a booklet, Gathering Our Heritage (about seaweed harvest) in 2006. They live in Victoria, British Columbia. GORDON SWITZER is a historian, writer and editor who grew up in Japan from the age of three. He returned to North America after attending a year at I.C.U. in Tokyo. A long-time student of Zen Buddhism, he recently published Zen Within the Tao Te Ching. He and Ann-Lee have been members of the Victoria Nikkei Cultural Society since 2001. Their most recent work is Sakura in Stone: Victoria’s Japanese Legacy. Last year both of them travelled to Japan and visited Kuchinotsu, Manzo Nagano’s home town in Nagasaki prefecture, in search of early documents. KEIKO MIYAMATSU SAUNDERS: Immigrated to Canada in 1973. After 10 years with the Nihon Keizai Shimbun (Nikkei) Toronto Bureau, branched into freelance writing. Moved to Victoria in 2014 and continued to write about Canadian social issues for publications in Toronto, Vancouver, Victoria and Japan. Authored a number of books and most recently oversaw the translation and publication of the Japanese version of Gateway to Promise 「希望の国カナダ・・・、夢に懸け、海を渡った移民たち」. Is the book, “Departures: Chronicling…”, available for sale? Yes, the book Departures is available for sale at the Nikkei National Museum bookstore in Burnaby or you can purchase on-line. $20.95 plus tax and shipping. It’s a great book, lots of unique stories and perspectives. © Copyright 2017 ~ Landscapes of Injustice. All rights reserved.